For a complete breakdown of party planning steps and organization, see my Birthday Party Planning post. 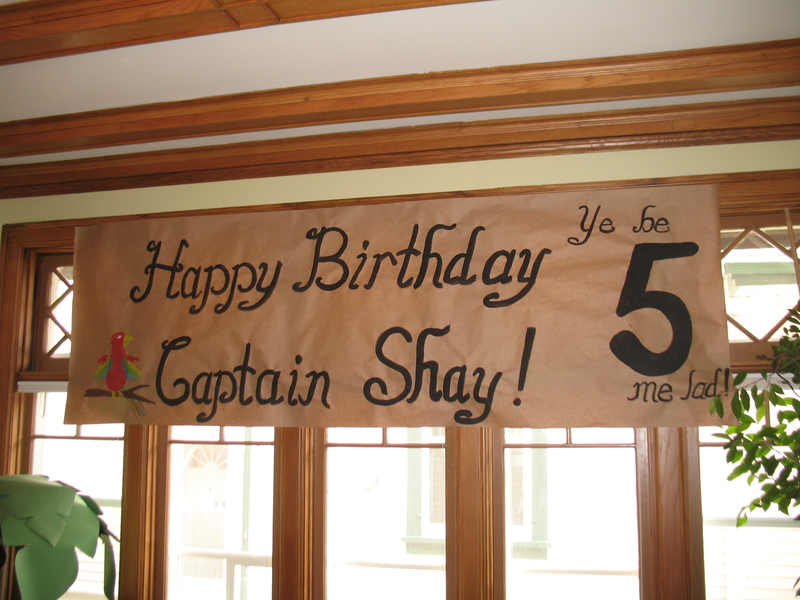 We did a Pirate theme for my son’s 5th birthday. This was one of those over the top parties that took lots of time and energy to pull together, but it was great fun! These invitations were so much fun to make. I wrote the invitation and then tried to “translate” it into pirate language. I Googled pirate words and even found examples of invitations others had made that I could use as a guide. After figuring out what I was going to write, I had to search the web for an appropriate font. I often pick a font that is specific to my party theme and this was no exception. Unfortunately, I can’t share the name of the font, as I now have a Mac and my computer doesn’t recognize the font in the original document. I have several places that I download fonts from, but dafont and fontspace are two that I often use. I can’t be sure by I think that Rapscallion and Treasure Map Dead hand look familiar from fontspace. I changed the fonts and then printed the invitations off on my computer. I then dipped them in tea to dye/age them and then set them out flat to dry completely. The mock treasure map was actually a map to our house, with the X marking our house.We rolled the map and invitation together, scroll style and added them to an old bottle with some sand and a seashell in the bottom. We corked the bottle and added a personalized tag to each bottle. My son and I delivered our “message in a bottle” to each guest. For this party, we had lots of decorations to pull the theme together. The guests were required to “walk the plank” on our front sidewalk before entering. As they stepped up on our front porch, they were welcomed by a skeleton and sign on the front door. The skeleton is one of those milk jug skeletons. I made it for the party and then kept it for a Halloween decoration, so it served a dual purpose. Click the picture for a tutorial on how to make them. 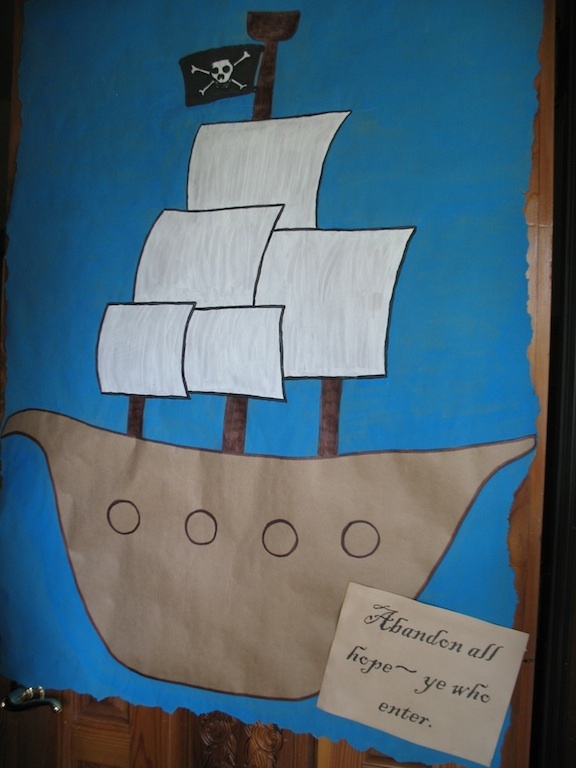 The big ship poster was on our front door. I made my standard Happy Birthday Banner. The parrot was made with my son’s handprints for the wings. 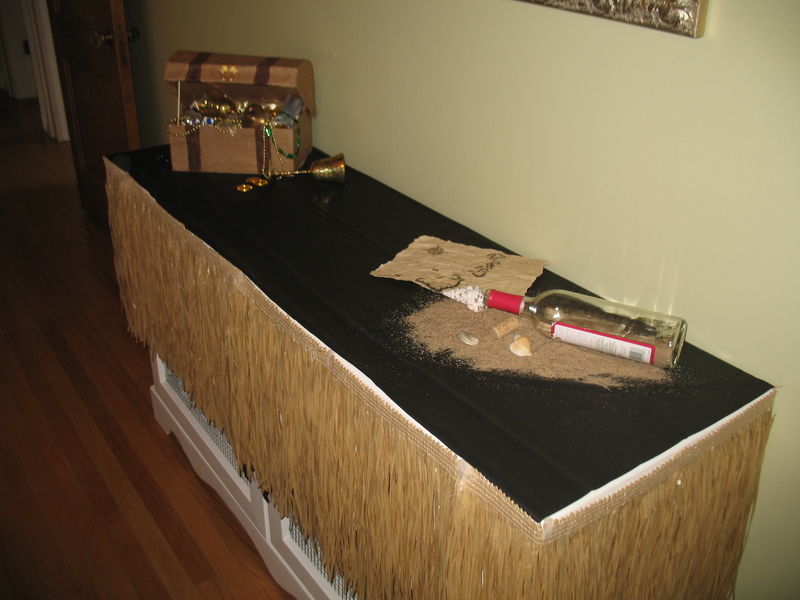 I made a palm tree from an old cardboard carpet roll and set out an old trunk for the gifts. I wrapped the gifts from us in brown paper with raffia ties to go with the theme. I made several signs that were posted around the house. 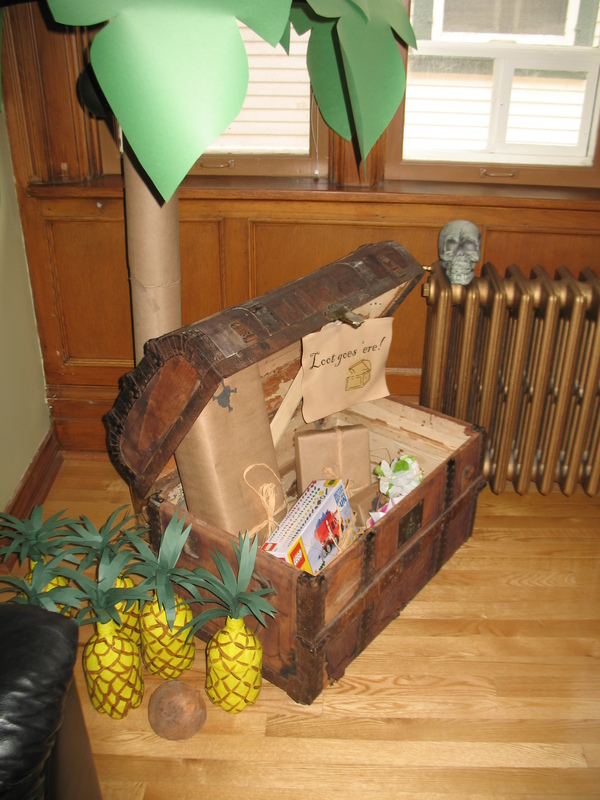 You can see this one says, “Loot Goes ‘ere!” You will also see some pineapples and a coconut next to the trunk. The coconut is real, but the pineapples were made for my daughter’s “Aloha” birthday party by applying paper maché over 2 litre pop bottles. The buffet had a few decorations as well. I covered a small box with paper maché and made a custom lid that had the rounded top like a trunk. I used a heavy cardboard that had the flexibility to bend (not corrugated). 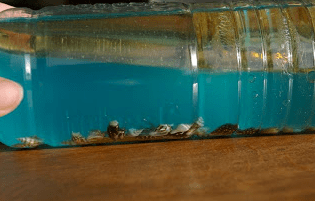 I then filled it with treasure from the dollar store and around the house (brass wine glasses that we received as a wedding gift, fake gold coins, beads, shiny pennies (soaked in vinegar and salt), etc). I also spilled out one of the invitation bottles and covered the edges with two grass skirts from the dollar store (much cheaper than purchasing an actual table skirt). There were several little “vignettes” set-up around our dining room and signs dispersed throughout the house and yard. We also purchased a pirated themed cd for background music. Here is a gallery showing more of the decorations. How Many Pretzels Can You Hook? This party was jam-packed with activities, so I did not put out much food. The only theme related food was Goldfish crackers. We also put out some watermelon, pretzels, chips and salsa. We also served a homemade punch. I don’t have specific tutorials to direct you to for the cakes. I tend to use Google images to get ideas and visit the sites connected to those images that interest me the most. I gather ideas from several sources to come up with my own versions. For the pirate ship cake, I was able to find little pirate action figures at the dollar store and the treasure chest originally held small candy. The pirate ship cake was sitting on a “treasure map” in the center of the table. The pirate cake and hat cake were basically fancy cutting. The stripes on the shirt are “fruit by the foot”. I often pre-cut ice cream to fit the theme. I bought vanilla cartons of ice cream and peeled the box off. This allowed me to cut the rectangular shape into 1″ slabs. I then used the skull and crossbones cookie cutter to cut the ice cream. 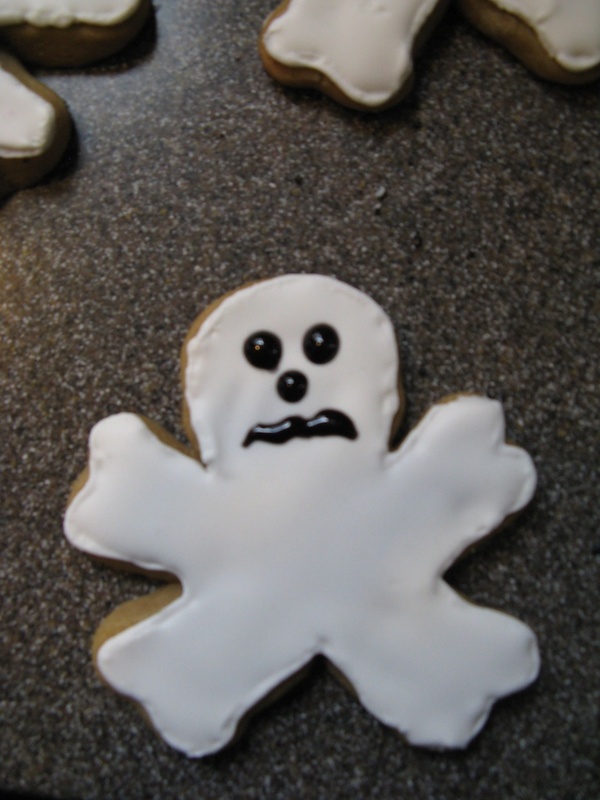 I then lay the cut-out pieces on wax paper on a cookie sheet for quick and easy serving. When the guests arrived, they each received a bandana, eye patch, “pirate” face paint and a pirate style tattoo. Some of the loot was in their actual loot bags, some they received and wore for the duration of the party and other loot was received throughout the party. The birthday boy and his sister were in full costume and my husband and I sported bandanas and eye-patches. This was one of the very best parties we did. The ideas were endless and it was so much fun! 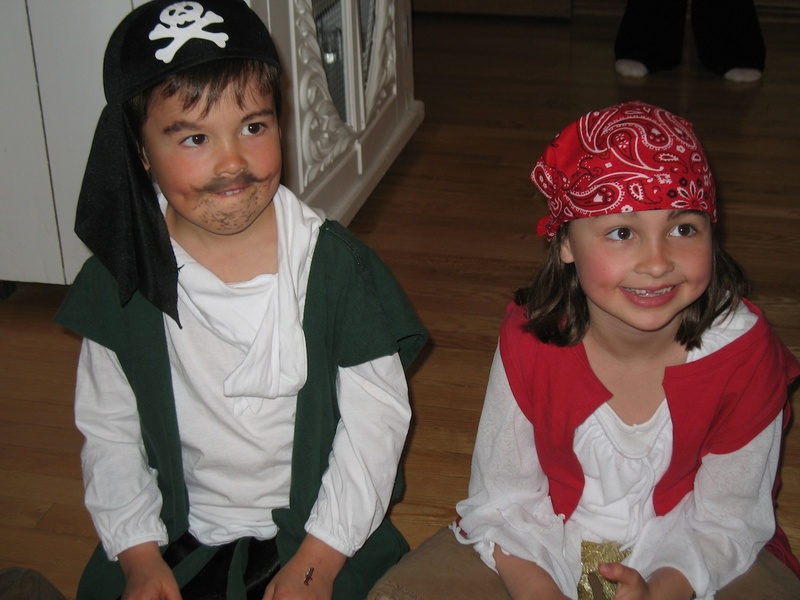 I would highly recommend a pirate theme party ~ it is guaranteed to be a big hit with both boys and girls!